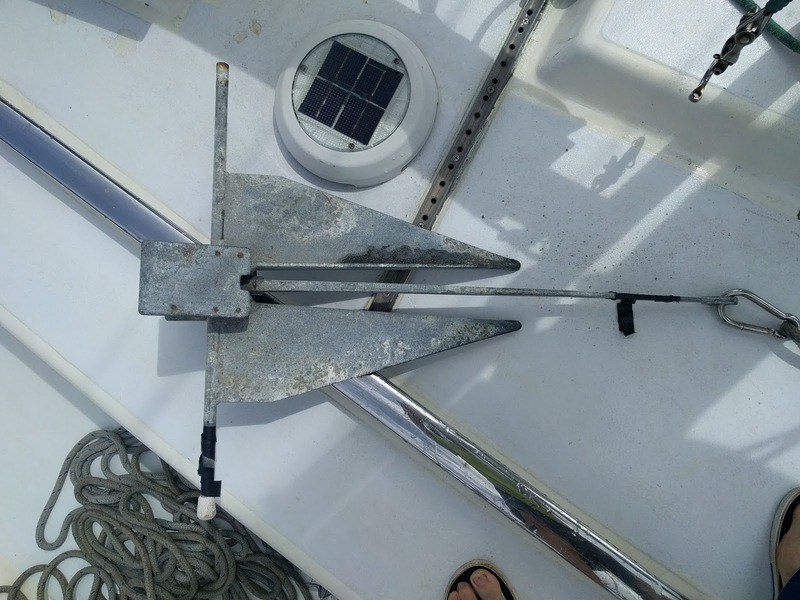 For 3 years now I have had a 10 lb fortress anchor taking up valuable real estate on my stern without being used. Two days ago the wind blew at right angles to the swell which resulted in a very uncomfortable motion on the boat. So the basic idea to improve the motion is that you put a stern anchor out and turn the boat to face the swell which results in it being a lot smoother. All well and good and as in most situations, the theory and reality are totally different. First of all when I did manage to get the boat facing in the right direction, it was a total success and for most of the day it was very comfortable while all the other boats here in the anchorage were doing figure eights. Now for the downside. First off it was more difficult to place the stern anchor than I had thought. I rowed it out and dropped it a bit further thinking that between pulling the boat around and the anchor sliding I could get it tied down. However it was not to be and at one stage I even lost hold of the rode and had to dive the 20 feet down to retrieve it. The next problem was other boats coming in to anchor and twice, boats came to anchor over the top of my anchors, not realizing where I had them. Once that happened, I couldn't move and trying to talk to non English speaking charter boat captains who could care less about their boats was very frustrating. A large Catamaran dragged down on me twice yesterday, so I didn't get much sleep last night. Anyway bottom line is that from now on, I will think twice about using a stern anchor. Here is a picture of my boat in the bay here taken by my fellow Kiwi, Max on s/v Drakkar. How do you like my new Kiwi flag he gave me? Max is Cruising with his young family and has a very good blog is at www.svdrakkar.com on the web.